Agalia is situated in Cradock which lies on the banks of the Great Fish River, on the site of what was intended as a Boer fort to contain the Xhosa people who competed for grazing grounds for their cattle in this part of the Cape. 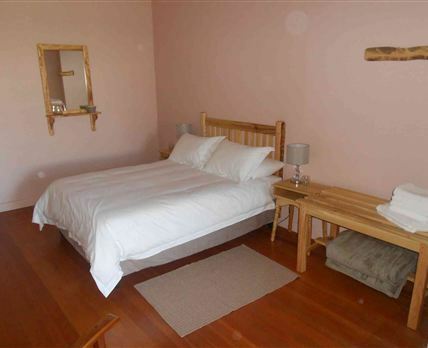 We have one Luxury Suite with a big bedroom offering a double bed and an en-suite bathroom. There is a lounge and dining room with an indoor braai and fully equipped kitchen, and there is a door leading out from the bedroom into the garden. The town’s streets are lined with oak trees, particularly on Dundas Street, where they have been declared a national monument. The Old Water Mill, completely restored, is worth a visit; and the Great Fish River Museum is housed in the converted second Dutch Reformed Church and conveys what it was like to live as a settler after 1806, during the second British occupation of the Cape. Click here to enquire at Agalia.